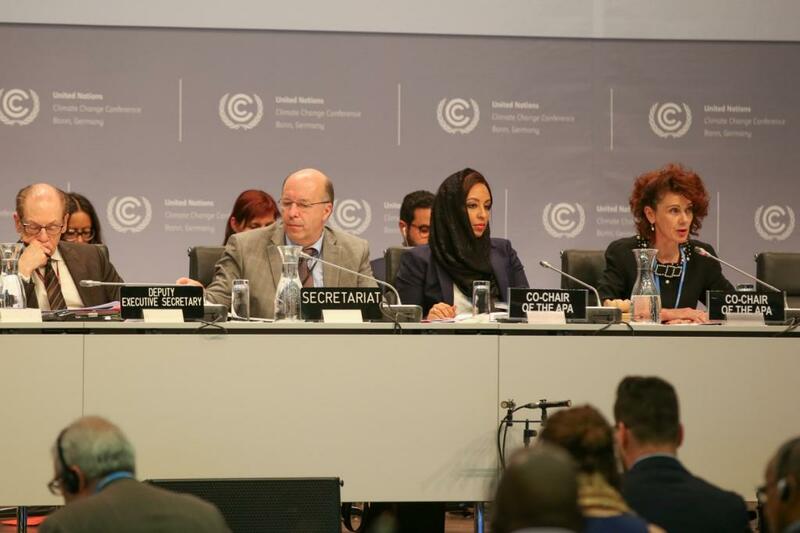 The Ad Hoc Working Group on the Paris Agreement (APA) on May 20 adopted its agenda for implementation of its mandate under the Paris Agreement at the ongoing Bonn climate talks. The agenda was due to be adopted at the APA’s first plenary meeting in the early days of the Bonn meet. But due to interventions by some Parties including the G-77, the plenary was suspended. Following closed meetings with Parties’ delegates for almost four days, the APA on May 20, at its second plenary, adopted the agenda. The revised agenda contains a significant inclusion of “Further guidance in relation to the adaptation communication including, inter alia, as a component of Nationally Determined Contributions”. In the previous draft of the agenda, the guidance was in relation to Nationally Determined Contributions (NDCs). However, due to the intervention of Parties including the G-77 and China, specific reference to adaptation was added. The agenda document also elaborates on language relating to global stocktake and facilitation of implementation of the Paris Agreement and its compliance. In this regard, the Co-Chairs of the APA, Sara Bashaan (Saudi Arabia) and Jo Tyndall (New Zealand) pointed out the importance that developing countries laid on adaptation. The co-chairs were “happy to report that the revised agenda was balanced”. The APA’s mandate is to provide further guidance on the features of NDCs, information to facilitate clarity, transparency and understanding of NDCs, provide modalities, procedures and guidelines for the transparency framework for action and support, identification of the sources of input for the global stocktake and development of the modalities of the global stocktake, modalities and procedures for the effective operation of the committee to facilitate implementation and promote compliance, taking stock of progress made by the subsidiary and constituted bodies in relation to their mandated work under the Paris Agreement and prepare for the entry into force of the Paris Agreement and prepare for the next Conference of Parties (CoP) at Marrakesh, Morocco. The agenda entails mostly technical work but it was recognised that political discussions would be required at some stage with relation to the elements of the agenda. The Co-Chairs also recognised that a lot of work needs to be done immediately with a policy of “no surprises”, implying transparency and inclusiveness. The next item for the APA is to agree on the organisation of the work of the session. To this end, interventions were made by groups including G-77, China and Like Minded Developing Countries (LMDC) stressing on maintaining transparency and inclusiveness, to limit the parallel sessions of discussions and to guide and supervise the contact or spin-off groups if they are formed to carry out discussions related to several items on the agenda. The APA adjourned the meeting, calling for more consultations with the Parties in relation to reach consensus on organisational work and re-convene at a later date. It is expected that the work carried on in this session by the APA would be captured in a reflections note towards the end of the session.